[…] Like John Quincy Adams’ 1830 essay, Raymond Ibrahim’s new Sword and Scimitar should be requisite reading for all serious U.S. policymakers, diplomats, and politicians. This magisterial work is a lucid, remarkably compendious, yet still richly detailed study of the 1400-year ongoing ebb and flow of Islamic jihad conquests or preparatory attacks — and the Christian West’s reconquests or reprisals. A skilled Arabic linguist and student of military history under the tutelage of Professor Victor Davis Hanson, perhaps the outstanding achievement of Ibrahim’s compelling narrative is how it shatters contemporary “academia’s” rigidly enforced, dogmatic Islamophilia. Intrinsic to this frank, accurate presentation of the contrasting religious outlooks is the wanton destruction wrought upon Christian lands by all the major ethnic Muslim invaders (Arabo-Berbers, Turks, and Tatars). This repeated practice is consistent with Islam’s doctrinal jihad-hatred of Christianity — and is not shared by Christian doctrine, or “reciprocal” actions, on anywhere near the same scale when the Christians triumphed. During his pre-battle speech, as clergymen marched with crosses and pronounced the death prayer on the kneeling men, Vahan [an Armenian leader of the Christian allies] explained that “these Arabs who stand before you seek to … enslave your children and women.” Another [Christian] general warned the men to fight hard, otherwise “they shall conquer your lands and ravish your women.” Such fears were not unwarranted. [T]raditional Muslim historiography concerning why Muslims won holds that their win-win bargain with Allah — wherein the Muslim is rewarded with paradise either in the here [via booty, see entire Koran sura/chapter, “The Spoils of War,” 8: 1 ff, including sexual slaves, per 4:3;23:6] or hereafter [via “martyrdom,” Koran 61: 10– 12; 4: 74; 9: 111, and the eternal prize of Islam’s cosmic brothel, 44: 51– 56; 52: 17– 29; 55: 46–78] — enthused the Arabs’ fighting spirit to no end. 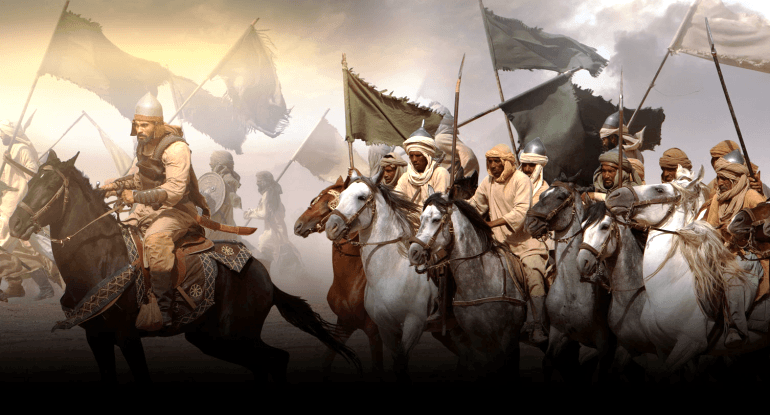 Just seventy-three years after Yarmuk, all ancient Christian lands between Greater Syria to the east and Mauritania (Morocco) to the west — approximately 3,700 miles — were forever conquered by Islam. Put differently, two-thirds (or 66 percent) of Christendom’s original territory — including three of the five most important centers of Christianity — Jerusalem (With the caveat that Jerusalem fell back to Christian hands during the Crusades and is today under Israeli authority), Antioch, and Alexandria — were permanently swallowed up by Islam and thoroughly Arabized. Over a millennium after the Muslim victory at Yarmuk, the same unchanged Muslim-Christian dynamics were apparent in distant Western Europe, circa 1683. A desperate and urgently assembled coalition of Christian forces — spearheaded by the Polish King Jan Sobieski (or John III of Poland) — broke the Ottoman jihad siege of Vienna, Austria.